The theme of this month's box is "free your mind." It is all about getting creative and experimenting. 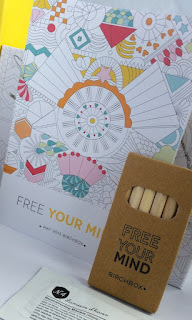 The box design is a fantastic idea and I particularly love the fact that this box is a black and white pattern that you can colour in (it even comes with a mini box of colouring pencils!). I was super excited to colour in my box, but my little man managed to get his hands on it first and coloured all over it in black crayon! 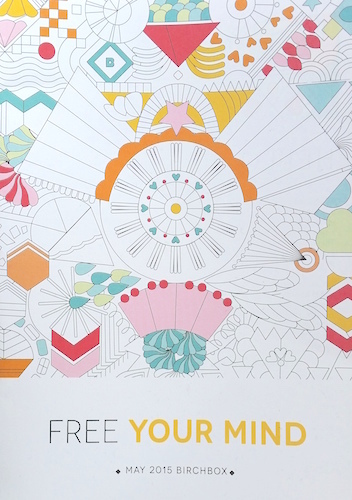 Maybe I'll have to invest in an adult colouring book instead! The Mirenesse Mattfinity Lip Rouge is a matte lip colour that provides a long-lasting, highly pigmented, vibrant shade to the lips. It has a mousse-like texture that helps to fill in lines and to make lips look fuller. It also claims not to feather or fade. I was so happy with this product that I've decided to write a full-length review of it. I'll update this post as soon as it is done! 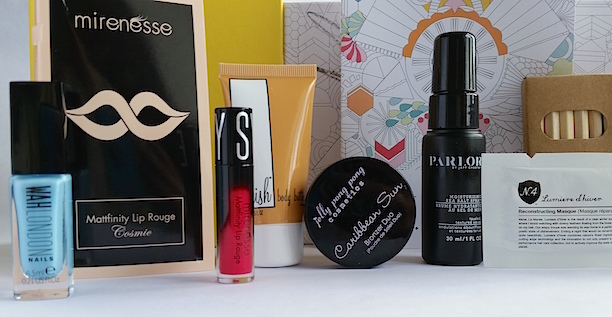 You can purchase a full-size tube of Mirenesse Mattfinity Lip Rouge for £21/7g from Birchbox. 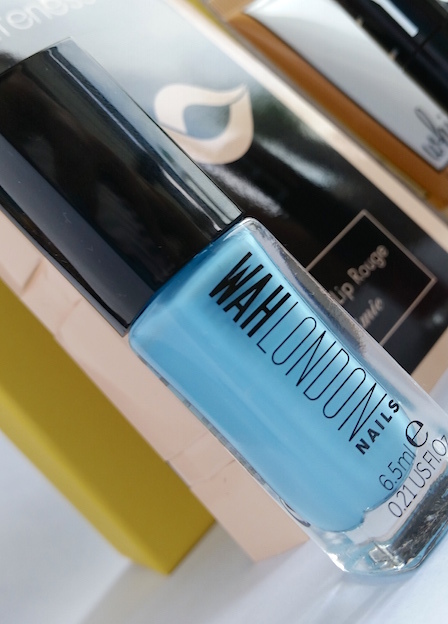 WAH London’s nail polishes claim to provide long-lasting, ultra-glossy colour to the nails for a professional looking manicure. I received the colour Private Plane which is a bright and cheerful blue. 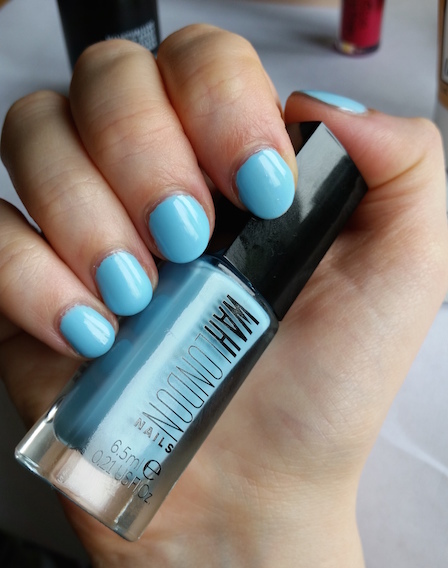 It's a gorgeous shade that I'm going to be sure to wear throughout Summer. Application was fast and easy, but the formula was quite thin. As I was in a rush I naughtily applied a thicker second coat to speed up the process rather than three thinner coats. I know, I know! In my opinion this nail polish did need three coats and I should have just gone with the three, but at least I'm being honest here! Thanks to the thicker second coat, my nails have began to chip and peel already after only two days. I think that if I would have done three thinner coats then things would be fine, so I'm not going to judge too harshly here. Putting those issues aside though, I really love the colour and I think that it's a great choice of nail polish to help brighten up an outfit (or your mood!). You can purchase a bottle of WAH London Nail Polish in Private Plane for £9/6.5ml from Birchbox. Whish Three Wishes Body Butter is an organic, non-greasy body lotion that features organic aloe, shea butter and raspberry butter to combat dryness. It also contains organic seaweed extract for its skin firming properties and organic rice bran oil which is an antioxidant and natural UV protector. I have ready received a sample of this body butter in last years July box, but instead of almond it was lavender. I feel that everything that I have to say about this has already been said before, so instead of repeating myself I’ll direct you to my July box review where you can read my thoughts on this body butter. If it were a product that I was disappointed with last time I would probably have been annoyed about receiving a duplicate, but I did like it before. This is the first time I've ever had this problem with Birchbox, but in this instance I'm not unhappy about it. 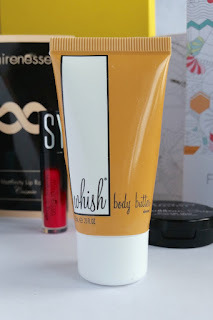 You can purchase a full-size bottle of Whish Three Wishes Body Butter in Almond for £14.50/150ml from Birchbox. Parlor by Jeff Chastain Moisturising Sea Salt Spray is a hair spray to create those beach-inspired waves. It adds volume and a tousled texture to your locks with minimum effort. I decided to give this spray a go, not seeing any ingredients that I tend to avoid. It adds a nice amount of volume to the hair and creating tousled waves is really easy with this salt spray. Just spray and scrunch your hair and you’re ready to go in seconds. As it’s moisturising, I didn’t encounter any dryness, which is great. However, in certain areas my hair did look a little greasy and heavy in comparison to other salt sprays that I've used in the past. Saying that though, the waves that I managed to achieve held a lot better and longer with this spray in comparison. You can purchase a full-size bottle of Parlor by Jeff Chastain Moisturising Sea Salt Spray for £17/147ml from Birchbox. 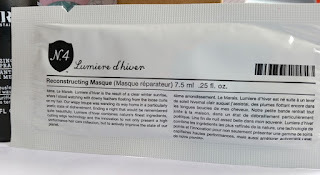 Number 4 Haircare Lumiere d'Hiver Reconstructing Masque is an intensive, strengthening, nourishing, conditioning and detangling masque for the hair. It contains jojoba seed oil, sunflower seed oil, shea butter, soy protein and silicone polymer. I always feel a bit bad when it comes to reviewing Birchbox samples when there are hair products included. I prefer to avoid certain harsh ingredients in my haircare products and therefore this leaves me with problems when the samples I receive include them. This is another one of those items that I’m sadly passing on for somebody else to try due to the silicones. Without wanting to ignore Number 4 Haircare entirely though, I will say that their Lumiere d'Hiver Super Comb & Protect spray is an amazing product that is definitely well worth a go! 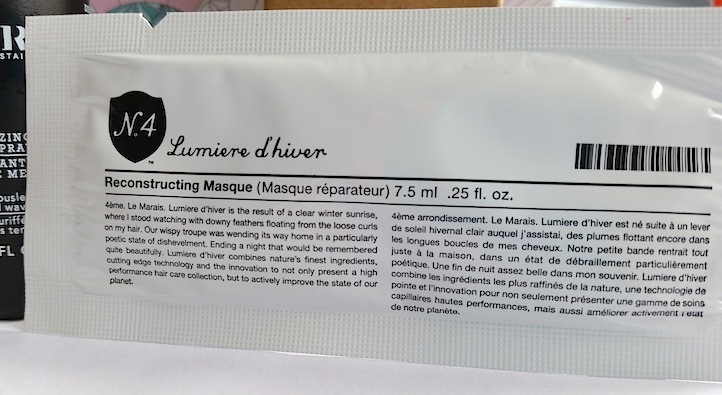 You can purchase a full-size Number 4 Haircare Lumiere d'Hiver Reconstructing Masque for £36 from Birchbox. The Jelly Pong Pong Caribbean Sun Bronzer Duo is a two-in-one bronzer and blush compact. As well as providing a natural flush of colour, the blush contains shimmer to provide radiance. They both contain mango and argan butters to help the skin look as if you have just arrived home from a holiday in the Caribbean. The tray that contains the bronzer and blusher was a little small on this sample and therefore it made it kind of difficult to get the brush in to apply, but obviously this is just a sample and therefore I’m sure that the full-size wouldn’t pose this issue. Once on the skin though, I think that the combo look really great. 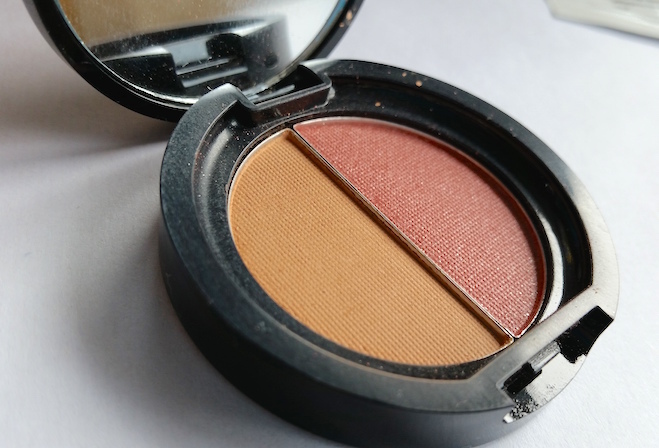 I’m happier with the bronzer as I found that personally the blusher has a bit too much shimmer for me and my oily skin, but it still does have a lovely colour payoff. It's a great little product though if you're on the hunt for a new, handy compact! 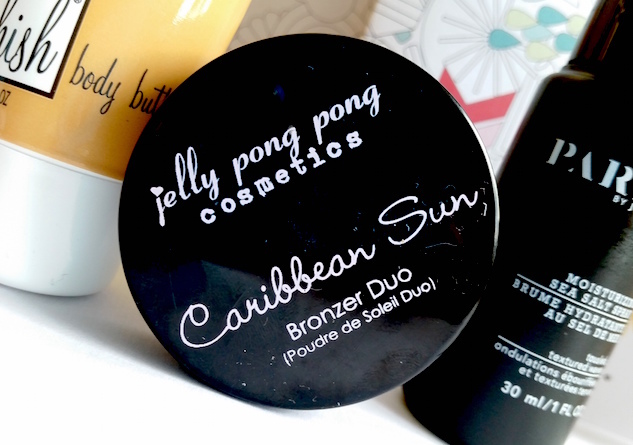 You can purchase a full-size Jelly Pong Pong Caribbean Sun Bronzer Duo for £15.95/3g from Birchbox. Overall I think that this box is a pretty good one. 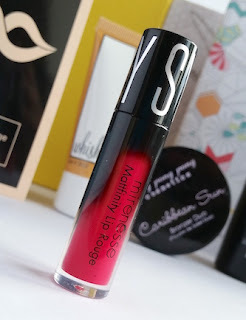 My favourite product this month by far is the Mirenesse Mattfinity Lip Rouge in Sydney. It is an incredible lip colour that I simply cannot get enough of! The theme itself is a great idea that I really, really love. I wish that I got a chance to give the colouring in a go myself, but my little man was definitely having a great time with his crayons!